We would like to thank all our alternative energy customers! We have put a lot of time and effort into, not only knowing our products, but also knowing our competitor’s products, and how OUR products better serve OUR customers. We have several brands of wood pellets. We carry economically priced wood pellets, all the way up to a high-end, high BTU wood pellets. We have compiled a large amount of data on wood pellets and would be happy to share it with you on why the products Harris Energy sells are superior to our competitions. See below for complete information on our pellet brands. Click here for current pricing of alternative energy products at Harris Energy. We have also found that customers have been very receptive to buying their Alternative Energy and Heating Fuel from a local company. We are the only company in the area that can provide you with one-stop shopping for your Heating Fuels and Alternative Energy needs. Read reviews from other pellet consumers at Wood Pellet Reviews. 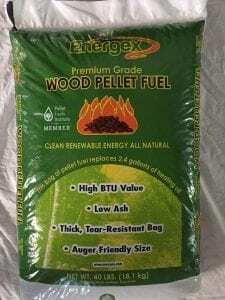 The Vermont Wood Pellet Company produces super premium, clean burning, high BTU wood pellets available in easy to handle 40 lb bags and by the ton. Low Ash – Vermont Wood Pellets are some of the cleanest burning pellets in the country, with the lowest ash residue of any major manufacturer. Less ash means less work and maintenance for you and your stove! High BTUs – On average, one bag of pellet fuel equals 2.5 gallons of oil, or one ton equals 1½ cords of wood. Vermont Wood Pellets feature some of the highest BTU’s in the industry. That means more heat for your money! 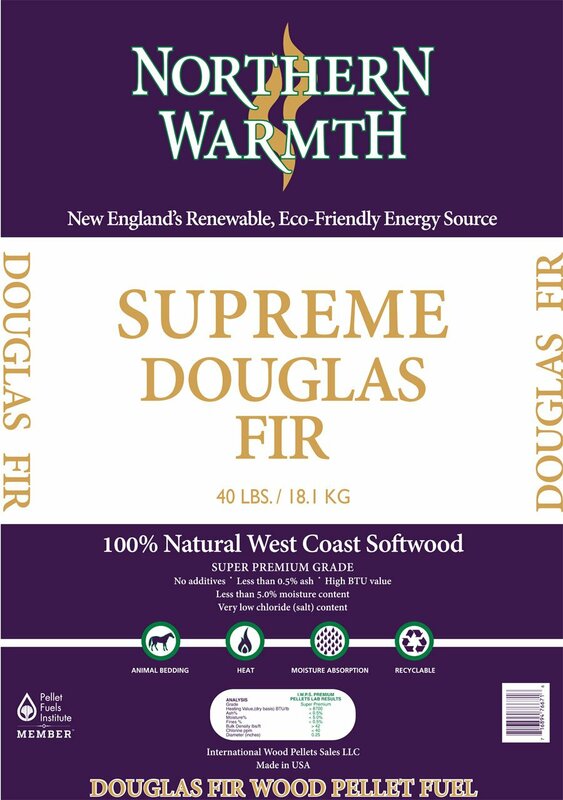 Northern Warmth Douglas Fir Super Premium Wood Pellets burn hotter, burn longer, burn cleaner! 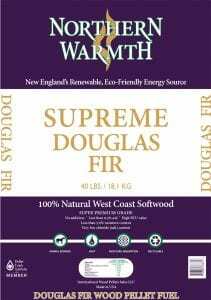 Northern Warmth Douglas Fir has set the standard for super premium fuel pellets. These pellets consist of clean 100% Natural West Coast Softwood Douglas Fir. This wood type burns hotter and cleaner than other wood types. 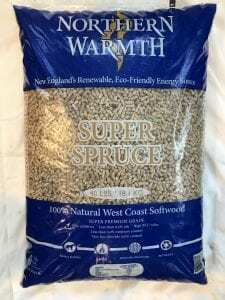 Northern Warmth Super Spruce Wood Pellets burns hottest of virtually any brand of pellets in this category. This premium softwood pellet is a blend of Spruce, Pine, Fir (SPF) and produces one of the lowest ash content of any of the product on the market today. Previously, the Okanagan Platinum pellets. Comfort Plus Hardwood Pellets are manufactured with outstanding natural fibers from the great “Northern Hardwood Forests” of North America where the slow growth and tight rings trees produce a wood pellet product that burns hotter, cleaner and longer, providing the warmth, comfort, and security that your family deserves. Okanagan Douglas Fir is certainly the best wood pellet on the market. 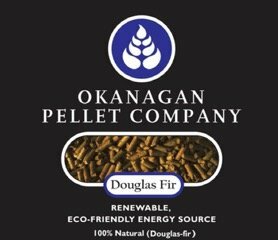 Burning hotter, longer, and cleaner than any other wood pellet, Okanagan Douglas Fir has set the standard for super premium fuel pellets. Made from 100% Douglas Fir Softwood. Okanagan Douglas Fir does not use recycled wood, additives, plastic or waxes. Additionally, the very low ash content of this product results in less cleaning and maintenance of your stove, boiler, or furnace. 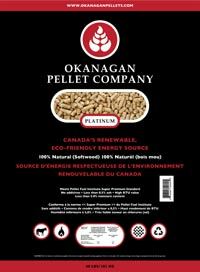 Okanagan Platinum is the pioneer of our wood pellet brands. Produced from exclusive Canadian pellet mills, these pellets are made from 100% softwood sawdust, with no additives, bark, or other contaminants. CANAWICK ecological pellets are made from 100% biodegradable residual sawdust free of additives of any kind. Made entirely of premium quality hardwood. They deliver superior heat output with very low moisture. Manufactured out of Lac-Mégantic, Quebec, the Premium Blend is truly the best of both worlds. The Blend is approximately 60% softwood and 40% hardwood which provides higher heat output and a lower ash content. This is one of the best Premium Grade pellets out there with an ash content between 0.5% and 0.7%. • 8,700+ BTU’s Per lbs. 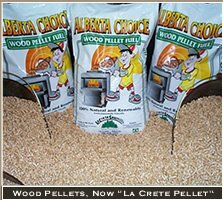 La Crete Sawmills Ltd. pellet fuel is made from clean, dry wood-waste fiber from our own lumber operations and neighbouring sawmills. Only the finest material is used and dried to the lowest moisture possible before being used in the pelletizing process. No additives are used, only the natural resins and binders hold the pellets together.. Efficient – Pellet fuel is an efficient and cost effective source of heat. The low moisture content increases combustion efficiency and results in high heat output. A single bag of fuel can burn for 24 hours or longer. Environmentally Friendly – The fuel produced, is clean, reliable heat with low emissions and less than 1% of ash. Material used is a by-product therefore it is considered a renewable wood resource. CANAWICK blocks are made from 100% natural, prime quality hardwood sawdust pressed without additives or chemicals. 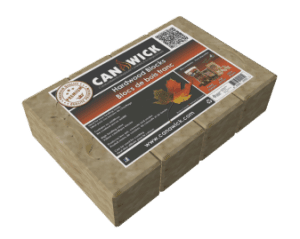 Designed to burn longer, CANAWICK blocks ensure superior heating efficiency while significantly cutting your heating costs. Easy to use, clean and convenient, our blocks are ideal as heating. Quality: Even heat flow and high level of BTUs make anthracite the warmest, most steady, comfortable heat source available. Convenient: Anthracite is very different from coal-burning of the past. When anthracite is used as the primary source of heat in a home or business, its modernized furnaces with coal-feeding and ash removal systems require little effort by the consumer. Environmentally Sound: Anthracite’s low sulfur and high carbon content makes it an extremely clean-burning fuel. Economical: Heat is measured in BTUs or British Thermal Units. Using this measurement as a comparison, the cost of anthracite can be significantly lower than gas, oil, electricity, cord wood, wood pellets, or propane. 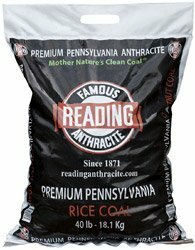 Reading Anthracite Coal: available in rice, pea, and nut. By bag, truck, or freight, Reading Anthracite meets the demands for residential, commercial businesses, and institutional uses. Reading Anthracite also provides large scale heat needs to universities, medical facilities, and government agencies. Anthracite coal has been used for home heating for over 150 years and generates almost twice the heat per pound as wood pellets, corn, and other grains.